Correction: The original version of this article stated that the “Income and Transit Use” paper was the work of Steere Davies Gleave (SDG). This was an assumption on my part – that it was a continuation of their previous work. I have been advised by SDG that this paper is not their work, but that of Metrolinx staff. All references to SDG in connection with this paper have been modified appropriately. My apologies to SDG for mis-attributing work to them. Updated: This article was updated on February 19 at 6:45 pm to include comments on the things Metrolinx should also be studying, but omitted in their review of incomes and transit use. Scroll down to the end to see the update. In two previous articles, I have examined the February 2017 update to the Metrolinx Board by staff on Regional Fare Integration, and a June 2016 background study by Steere Davies Gleave [SDG] on fare integration concepts. The context for this study, nominally, is to determine whether a new fare scheme will affect low-income households. However, the selective examination of effects by Metrolinx staff focuses on the benefits of a lower fare for “short” trips while playing down the effect on “long” ones. For the purpose of the analysis, Metrolinx looked at a fine-grained version of census data, “dissemination areas”, where each element contains less than 1,000 people. Each of these areas would lie within one geographic section of travel surveys (the Transportation Tomorrow Survey which, at the time of writing would have been based on 2011 data), and the transit usage for each dissemination area was taken from the corresponding TTS area’s results. Census data on income was used to assign each census area to one of ten income ranges, and through this to map transportation patterns to incomes. Note that there was no adjustment to reflect the availability of transit in any of the census areas, and the results merge data across the region. The income groupings are based on dividing a population of 6.5 million into roughly equal groups of 650,000. “Equivalent income” is a value derived from a combination of household income and household size. 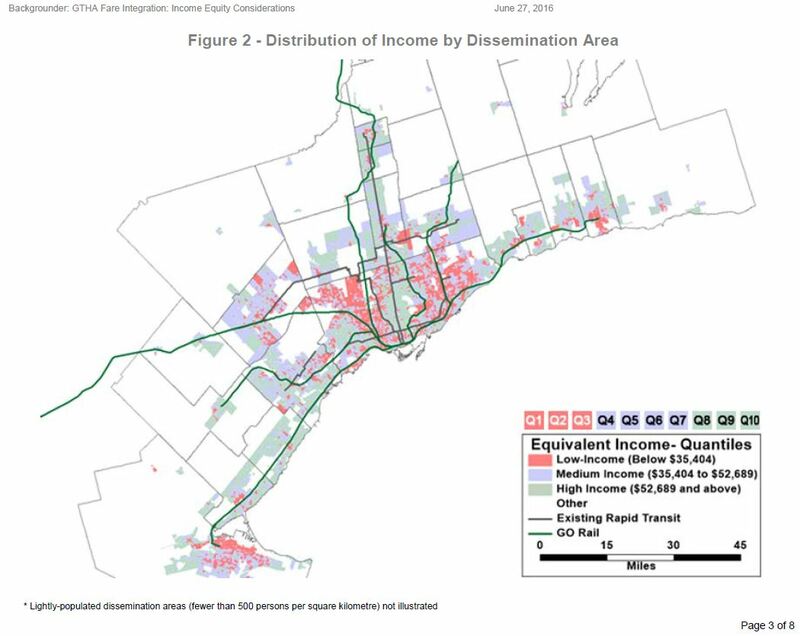 The actual distribution of income shows a familiar pattern with higher incomes along the Yonge Street corridor and in some parts of the 905, notably those well-served by GO Transit. 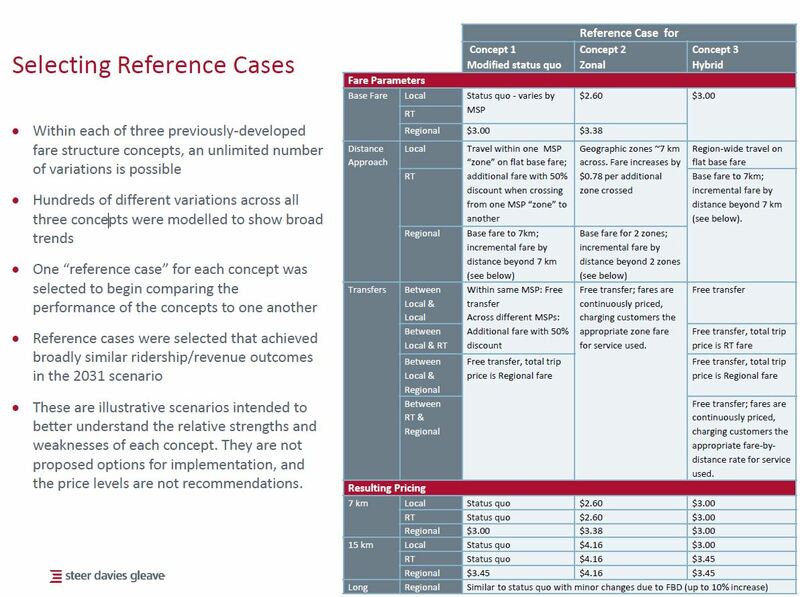 Back in June 2016, Metrolinx received two reports from its consultant, Steere Davies Gleave, that give some insight into the work and philosophy to that point on fare by distance schemes that Metrolinx contemplated. This article reviews the Concept Evaluation report. I will turn to the Income and Transit Use report in a separate post. A modified version of the existing flat fare system with adjustments to deal with the high premium for cross-border travel to and from Toronto. A hybrid system with flat fares region-wide for “local” buses (including local expresses and BRTs) and distance based fares for subways, SRT, LRTs and GO Transit (rail and bus). The recently added fourth option, a full fare by distance tariff, was not in the mix. The breakdown within the “hybrid” option was acknowledged to be incomplete with assumptions such as the placement of BRT and the need for additional classes of service still up for debate. The starting point for all sample fares was the then existing $3.00 cash fare on the TTC. The exact value is less important than the ratio between that base value and other proposed fares. For Concept 1, there are only two changes. First, transfers between service providers would include a 50% discount on the second fare. This would reduce the cross-boundary fare from 200% of the base value to 150%. On “regional” service (GO), trips up to 7km in length would charge the base fare, and beyond this a distance based tariff would kick in. This would reduce the high premium now charged by GO for very short trips including those within the City of Toronto. For Concept 3, “local” services (buses) would retain the base flat fare, but rail modes (plus GO buses) would see an incremental fare for trips beyond 7km. The example shown here is a $3.45 trip (a 15% premium) for a 15km “rapid transit” trip, but there is no specification of how this pricing would scale for longer or shorter journeys. Longer “regional” trips on GO would change by up to 10% because the longest trip prices (now lower on a distance basis than short trips) would have to be rebalanced to offset the reduced short trip fares. This all looks quite reasonable from the abstract viewpoint of a “pay for what you use” philosophy, but the effects on riders are not spelled out geographically. The 7km cutoff for zone size and for the onset of distance based fares implies a fare increase for many trips. To put this in context, here are the bounds of a 7km trip from various points within Toronto. Note that these are “crow fly” distances, not trips plotted on the transit/street network. The “old” City of Toronto is rather compact, and a great deal of it lies within 7km of the core. This is not unlike the old “Zone 1” of the TTC before zone fares were eliminated. The suburbs are quite another thing, and 7km does not get one very far. Scarborough is 15km east-west at Ellesmere, and 13km north-south at McCowan. Cheaper “local” fares might apply to short trips within Scarborough, but not to trips anywhere else in the region. The “crow fly” distance from STC to York University is almost 20km, and to the business district downtown 17km. With the goal of reducing cross-boundary fares, a whole new set of “long” trips that will pay a substantial premium for travel simply within the “amalgamated” City of Toronto will be created. Indeed, those cross-boundary riders will not see much of a benefit unless they live fairly close to their work locations. Scarborough Town Centre is more than 7km away from most of the area north of Steeles Avenue. Anyone working living in Rexdale but commuting to Markham faces a trip that will not bring the “cheaper” fare for short hops across the boundary. Richmond Hill is more than 7km north of Steeles. The big savings would actually come to GO customers who now pay a full TTC fare to switch to that system. Their “local” fare would be bundled with their “regional” one at a premium of at most 10% over current fares.